Most smartphones are sold with carrier bloatware on top of manufacturer bloatware, but the value of a phone that’s “pure Android” is to eliminate much of that annoyance. 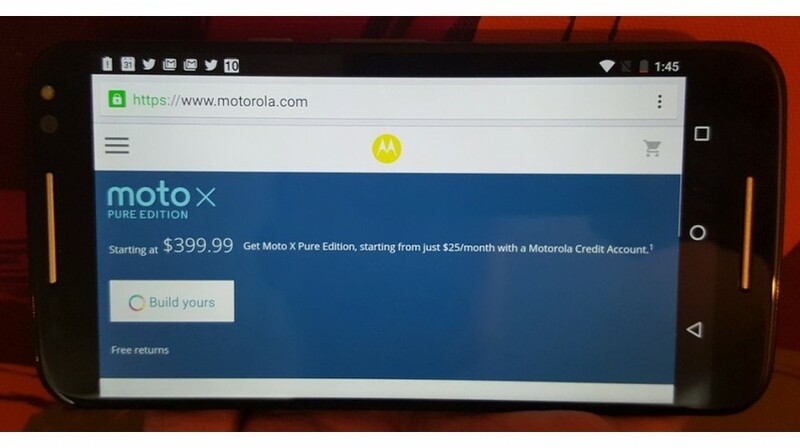 The Moto X Pure Edition is the third and latest iteration of the Moto X, and surprisingly priced lower than 2014’s Moto X. It’s the first Motorola phone with which Lenovo has been involved. And the device may become best known for what it doesn’t have rather than for what it does. The Moto X Pure Edition, is now larger, with a 5.7-inch 520 ppi Quad HD LCD screen. It retains many of the quick functions of older Moto X iterations, but this time around has a microSD card slot to expand file storage capacity to 128GB. The overall size of the new Moto X isn’t too large or too small, but will feel slightly heavier to seasoned flagship smartphone users. Twist-of-the-wrist camera activation is still a signature feature. As with 2013’s original Moto X, this model also encourages you to use your voice to initiate commands, such as sending texts by dictating words to someone in your contacts list. You can also activate a useful flashlight by moving the phone downward, quickly and twice. In sunlight, the screen on the new Moto X is great if you turn the brightness up. The Moto X is sold unlocked and is surprisingly designed to work on all of the four major U.S. carriers. According to Motorola, the phone operates on the following wireless bands: GSM/GPRS/EDGE: 850, 900, 1800, 1900 MHzUMTS/HSPA+: 850, 900, 1900, 2100 MHz CDMA 800, 850, 1900 MHz4G LTE B1, 2, 3, 4, 5, 7, 8, 12, 13, 17, 25, 26, 38, 41. Bloatware was deliberately left out of previous Moto X phones and the trend continues on this year’s Moto X. It uses a 1.8GHz Qualcomm Snapdragon 808 with hexa-core processor which works well running multiple apps, using 3GB of RAM. The TurboPower 25 charger is included and provides even faster charging, when compared to the charger included with the ASUS ZenFone 2. Motorola’s charger also didn’t get hot. The backspace key on the keyboard thankfully deletes one character at a time, at a sane speed, unlike Samsung keyboards which overzealously delete on a long press. You can also program custom shortcuts in the Moto X’s “Personal Dictionary” setting, such as “hhh” for “http://”. This function is extremely useful to people who regularly use ‘text expander’ apps designed for desktop computers. Pricing starts at $399.99 for the 16GB version, but can exceed $525 for higher GB versions with special backs. Unlike the previous Moto X smartphones, this one has a microSD card. The water-repellent nano-coating is a plus. Putting the new Moto X through several heavy usage stress tests, the battery life just wasn’t that impressive. It also has a sealed battery, which means Motorola-licensed businesses are the only people who should access the battery for any reason. While the battery life isn’t awful, you can’t help wishing it was better on this model. It takes time to get familiar with the interface on the Moto X Pure Edition which controls the ringer volume. It can easily be mistaken for the alarm volume controller. Whites on the screen can sometimes appear as ‘eggshell white’, instead of crisp white. 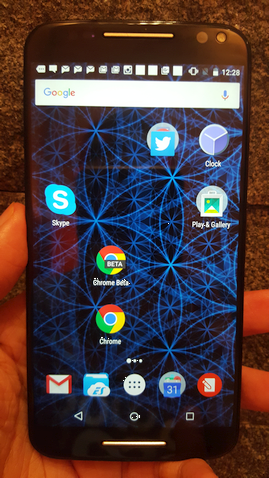 Some people also might feel the Moto X Pure Edition phone flirts with the privacy line. For example, if you utilize Google Now, the Moto X can always remind you to pick up your dry cleaning if you’re near a dry cleaner you’ve designated. Some users might find this useful and hard to live without, while other people might not appreciate it, and leave these ‘smart’ bonuses dormant. In either case, Google Now is optional. A final con is that the phone is currently only available through online ordering. This is a great phone for people who don’t touch smartphone bloatware and are also tired of tolerating it. Many Android users who have HTC or LG phones can say goodbye to bloatware by switching to Motorola. There’s much to love about this affordably-priced model. If you ask yourself what makes a great smartphone, answers are often about processor speed, reliable connectivity, ease of use, and having a large number of free apps from which to choose. The Moto X Pure Edition delivers on all four points and much more. The cons are very minor. Motorola provided the writer of this review with a complimentary Moto X Pure Edition. All opinions found in this review originate solely from the writer.